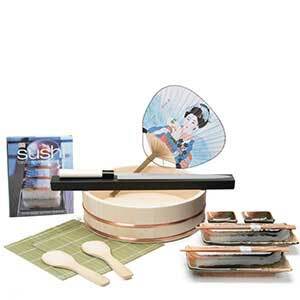 Everything you need for getting started making sushi! Different levels of starter kits available. Temaki (hand roll) is a popular sushi to make at home in Japan. Best when served fresh. 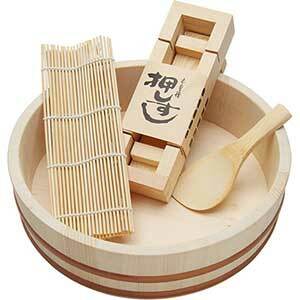 Classic wide slat sushi mat sized for creating hand rolls. 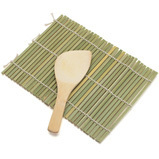 Slats have green bamboo skin on one side. Mat is 7 x 5.5 inches, paddle is 5.25 inches long. Made in China. 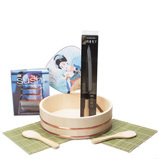 One 5.5" bamboo rice paddles, one 8.5" square sushi rolling mat (makisu), one Oshizushi 8"x2.5"x1.75" mold and a 10.75 inch wood rice tub (sushi-oke). 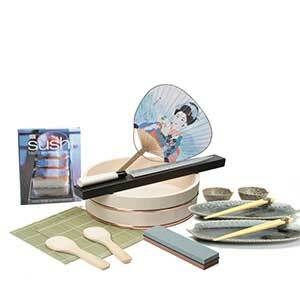 Great starter set for sushi making parties. Made in China.